Here we will approach waterproof mascara through two contributions. We owe the first to a man of the art, Christophe Delas, who directs the R&D activities of a company specialising in this product category and based in Luxembourg. Christophe makes a general point on the formulation through his experience. More particularly recognized for its expertise in waterproof mascaras, Luxcos proposes us here to return on this specific product, its history and its evolution over the years. This contribution is completed by formulation elements and addresses the question of certain types of mascara based on the use of siliphyl systems. The Austrian singer Hélène Winterstein-Kambersky was responsible for one of the first waterproof mascara formulas. She had experienced the faulty fit of the mascaras then available on the market during her stage performances. His numerous trials have led him to create a creamy formula that is easy to remove make-up. She even filed a patent in 1935. Its composition is in the form of an emulsion mainly comprising waxes, an emulsifier and turpentine oil. This composition was characterized by a very unpleasant smell. Helena Rubinstein worked on this subject and marketed the first waterproof mascara in 1939. An aquatic ballet presented at the New York World's Fair will serve as a demonstration for this innovation. The formula is in the form of a cake and includes waxes, carbon black and turpentine. In 1956, Jean Cocteau called the"Empress of Cosmetics" launched the Mascara Matic, defining the form and use of modern"automatic" mascaras. In 1964, the waterproof formula was adapted to combine these two inventions: a waterproof mascara and automatic packaging. Longlash waterproof mascara was born. This product will be a huge success. On the formulation side, waterproof mascaras are mainly divided into two groups: single-phase anhydrous mascaras and water-in-oil emulsions. Anhydrous mascaras are mainly marketed in hot and humid countries, mainly in Asia. Emulsion formulas are more commonly marketed in other geographical areas. Whether in an anhydrous or emulsion form, waterproof mascaras usually include a volatile organic solvent as the main ingredient. Isododecane is mainly chosen for these formulas, but also hydrogenated polyisobutene for Asian formulas in particular. Cyclomethicones are also used, although in a smaller proportion. Other components of waterproof mascaras include waxes such as paraffin wax, carnauba wax or beeswax. Depending on the formula (emulsion or single phase), different types of gelling agents are used. In anhydrous environments, dextrin palmates or hectorite derivatives are preferred where waxes are the first choice to play this role in emulsion mascaras. Hydrophobic filmogens can also be added to these formulas. The presence of water in emulsion type formulas speeds up drying time. On the color side, the mascara formulator sees life in black with one limitation though. 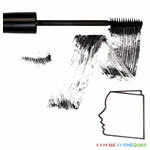 It will avoid the use of carbon black in this type of mascara. This would greatly complicate make-up removal given the fatty nature of this pigment and it will prefer iron oxide to achieve this intense black color so sought after. Blue, brown, plum or green mascaras, for example, are obviously possible, in the same way as so-called"cream" mascaras. The use of waterproof mascaras was and still is linked to two main factors: meteorology but also a number of specific activities (sport, swimming pool, beach…). Indeed, our studies in this field have shown that waterproof mascaras consumption is more sustained in geographical areas where ambient humidity levels are high. We will think in particular of certain Asian countries in which waterproof mascara represents a higher percentage of sales in comparison with Western European countries, for example. Certain European countries are also exceptions, the consumption of waterproof mascaras being then linked to a way of life and a not very mild meteorology. What are the factors that limit the use of waterproof mascaras when they should be indispensable? Special smell? Difficult make-up removal? Recessed effects? We have to talk about it, waterproof mascaras require certain compromises. This surely explains why they only represent about 30% of mascara sales overall, a percentage that has been increasing in recent years. At the same time, so-called"water resistant" mascaras have also appeared, only partially meeting consumers' expectations in terms of wet fastness and effects. The volatile organic ingredients and certain waxes used in high percentages give the formula a particular odour that diminishes during drying. In fact, these formulas also require the use of specific make-up removers, usually two-phase formulas, which contain essential oils to redissolve the mascara that has dried. Waterproof mascaras are also considered aggressive compositions for lashes and could influence their fall or"bad condition". Finally, the performance of waterproof mascaras was generally considered to be lower than that of cream mascaras. It is at this level that the packaging development / formulator couple comes into play. The waterproof mascara is no exception on this point and as for the cream mascaras, the packaging must be in perfect adequacy with the formula and vice versa. This harmony can be summed up in particular by optimising the loading of the brush by the formula in the tube, its controlled spin-drying by the wiper and finally by the maximum but controlled transfer of the brush composition on the lashes. The applicator can be chosen from fibre brushes and elastomer brushes (beware of incompatibilities in the latter case). In the case of elastomer applicators, it is possible to"play" on the size of the brush (with respect to that of the stem in particular) but also on the length, the shape and the flexibility of the pins which constitute it. For fibre brushes, the options are endless with the possibility of modulating the shape and size of the brush but also the length, hardness and shape of the fibres. Everything is possible but this should not be done without discussion with the formulator who knows its formula in terms of viscosity, texture and loading rate, to mention only these parameters. If the packaging and the applicator are chosen, it is up to the formulator to adapt its composition to optimise the effects sought by the consumer. Thanks to the work of packaging / formulator collaboration, the general level of performance has risen and waterproof mascaras are now competing with cream formulas. With these improvements, waterproof mascara is no longer the only mascara in a range of mascaras, but is part of franchises in which consumers can choose the cream or waterproof version of their favourite mascara. For this reason, and as for the cream mascaras, the waterproof mascaras are declined today in version curl, longlash and obviously volume, dominant claim in mascara. Formulators have even developed ways to produce"ultrablack" versions without using carbon black. Beyond the waterproof character, these mascaras are increasingly associated with long-lasting hold. Mascara is no exception to this trend, as are nail polishes, foundations, lipgloss or lipsticks. Our Research and Development laboratory has obviously integrated this request and is working on this subject as well on the waterproof mascara side as on the cream mascara side. The objectives are, in this case, the development of'long-lasting effect' compositions, no smudge and no flake, by adding specific polymers. The laboratory formulators work closely with our packaging collaborator to develop relevant and effective combinations to meet consumer expectations. Our laboratory is also working on the development of alternative waterproof mascara formulations in which certain ingredients, currently considered essential, will not be used. But that is another story. As indicated above, these formulas, until recently, were based exclusively on two types of formulas: use of wax solutions, much like the waxing formulas that originally inspired formulators, or continuous oil phase emulsions that quickly completed this type of formulas. In all cases, the goal is to form a continuous film of waxes, coloured on the surface of the lash, film perfectly resistant to water. The fatty phase is composed of waxes, solvent oils, waxes, surfactants and viscosity agents. - Waxes These are often natural waxes, beeswax, palm wax (carnauba), rice wax, or even soft paraffins so that the dry extract and viscosity can be adjusted while ensuring satisfactory viscosity. - Solvent wax oils More and more often, better defined substances such as isodecane, isohexadecane and pseudovolatile oils obtained by the hydrogenation of polyisobutylene (hydrogenated isoprenes) are used, mainly composed of petroleum cracking products, spirit of petrolatum distillates or C11 to C15 isopraffins. Low molecular weight silicones, called volatile silicones, have often been used as a complement, but not mainly because of their poor solvency with respect to waxes. - Surfactants They are used when the formulation is a water/oil emulsion. These have long been made from a traditional beeswax/borax couple, the principle being to neutralize the free fatty acids of the wax by the soda released by the borax. Borax restrictions will lead to changes to the forms. The surfactants used are characterized by an HLB of less than 8: they are either ethoxylated wax derivatives (PEG-8 Beeswax) or sterols of natural or synthetic origin. The interest of these water containing formulas would be that the water resistance character would be improved by the low amount of water in the constitution of the formula. - Viscosity agents They are most often derivatives of organophyl clays, sometimes wet with ethanol or propylene carbonate. Under the constraint of special precautions, in particular the total absence of solvents in industrial environments, some proposed the formulation of a rather particular type of product. These are mascaras based on water-based emulsions with high water resistance. From a formulation point of view, there are two approaches. - Resistant aqua type formulas, whose water resistance is further increased by a higher concentration of resins, polyurethane for example, and reinforced by hydrophobic resins such as alkylated PVP or silicone resins (trimethylsiloxysilicate). - Siliphyl systems, composed of emulsions based on silicones, volatile fractions and resins, combined with silicone emulsifiers, to obtain excellent water resistance. These different formulation approaches constitute to date the means of obtaining these products which represent an important part of make-up products. Other types of formulations, more anecdotal, such as eyelash waxes, mascaras based on gel, formulas based on tackifying resins, exist but in a more marginal way. An update on these form systems will be made in a future contribution. Contribution made by Jean Claude Le Joliff A biologist by training, Jean Claude Le Joliff was a man of R&D for many years. Successively in charge of R&D, then of Research and Innovation in a large French group of cosmetics and luxury goods, and after an experience of setting up a research centre (CERIES), he turned to innovation management. He has also been Associate Professor at the University of Versailles Saint Quentin (UVSQ) and remains a lecturer in several specialized courses: ISIPCA, IPIL, ITECH, UBS, UCO, SFC, etc. Consultant to several international companies, he has actively participated in projects such as Filorga, Aïny, Fareva, and many others. He created the Cosmétothèque®, the industry's first conservatory of crafts and know-how. Oct. 16, 2018 Spotlight on nails!